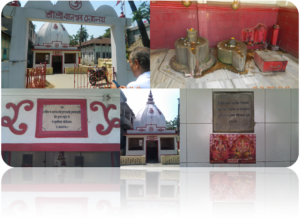 Baneswar Temple is one of the less well known Shiva Temple of Guwahati. It was constructed in 1820 AD by King Chandrakanta Singha. It is a small temple with one block oriented to east facing Brahmaputra river on the MG Road. It has rectangular plan with square garbhagrah. There are twin Shiva Linga and two images on on a stone block a part of old pillar stored here. Building is restored in 1979 by Marvari Panchayat Sangha, Sri Radhakrishana, Kripalal. Temple is surrounded by high rising buildings. There is no permanent priest in the temple and local people come for worshiping.